A charming map of Beijing during the Interwar Years. 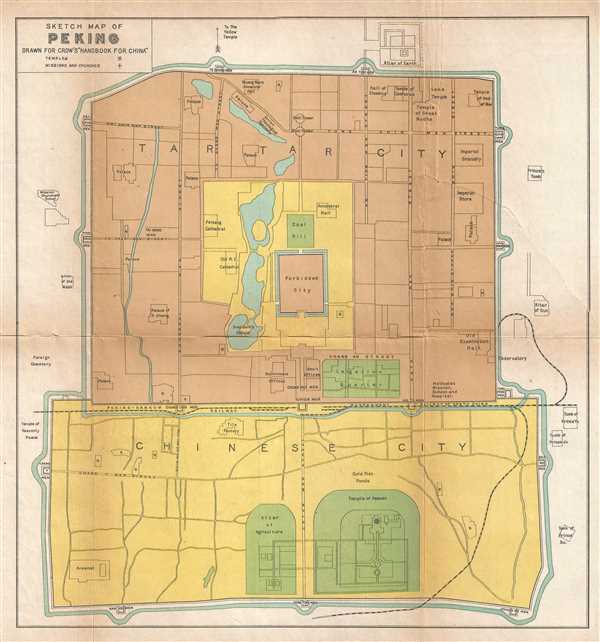 This is a 1921 Carl Crow map of Beijing (Peking), China. The map depicts the Tartar City, the Chinese City, the Imperial City and the Forbidden City as well as the immediate surroundings of these four sections of Beijing. Numerous locations throughout the map are labeled, including several palaces, temples, tombs, and altars, the Imperial Granalry, and the Imperial Store. Roads are illustrated throughout the four cities and the major thoroughfares are labeled. The Peking-Hankow Railway and the Government Railway of North China are also illustrated. This map was published by Carl Crow in his Handbook for China in 1921. Carl Crow (1884 - 1945) was a born in Missouri and is known for, among several achievements, opening the first Western advertising agency in Shanghai, China. Crow arrived in Shanghai in 1911, where he lived for 25 years. He worked as a journalist, newspaper proprietor, and advertising agent, while also spending time as a hostage negotiator, police sergeant, farmer, and a liaison for the U.S. government. He was also a celebrated author whose book, 400 Million Customers, won several awards when it came out in the 1930s and has been reprinted at least twice during the 21st century. During his time in China he met and interviewed most of the major figures of the day, including Chiang Kai-shek and Mao Zedong's second-in-command Zhou En-lai. Fearing retribution because of his anti-Japanese sentiments, he left Shanghai in 1937, only a couple of days after the Japanese attacked during the Second Sino-Japanese War. He worked for American intelligence during the Second World War and became one of the first westerners to journey up the Burma Road. He died in Manhattan in 1945. Crow, C. The Travelers' Handbook for China (including Hong Kong) 3rd Edition (Shanghai: Carl Crow) 1921. Good. Backed on archival tissue for stability. Wear and toning along original fold lines. Closed tear extending five inches into printed area from right margin professionally repaired. Blank on verso.